Happy Friday to you! I am so happy the weekend is just about here. It’s Mother’s Day weekend and I think I am going to dinner Saturday evening with Little Jenny. She has to work on Mother’s Day so we are celebrating on Saturday. I’m glad to be honest. Sunday’s are my relaxing and baking day. Speaking of baking, last Sunday I made today’s recipe. One of my favorite Sunday things to do is to bake cookies. 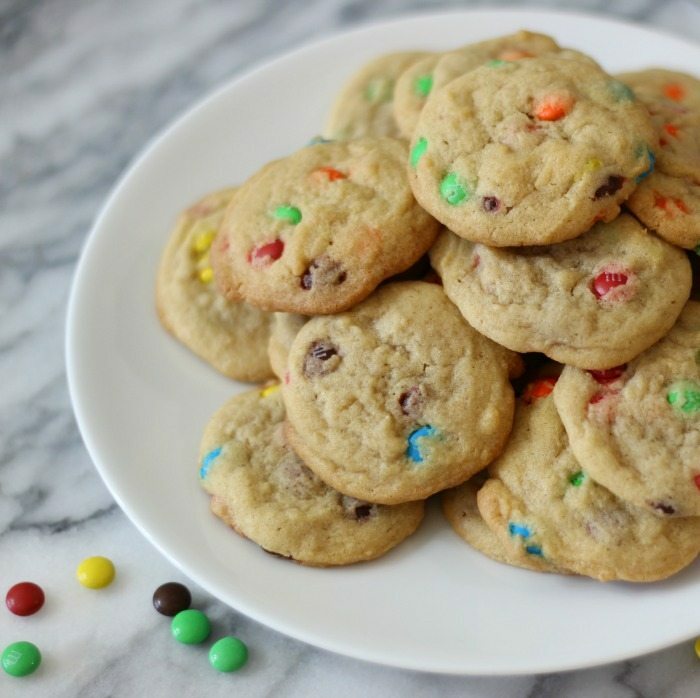 I was inspired to make these cookies by going to Target and seeing a big rack of M&M’s. I love M&M’s! There one of those secret indulgences that I have. 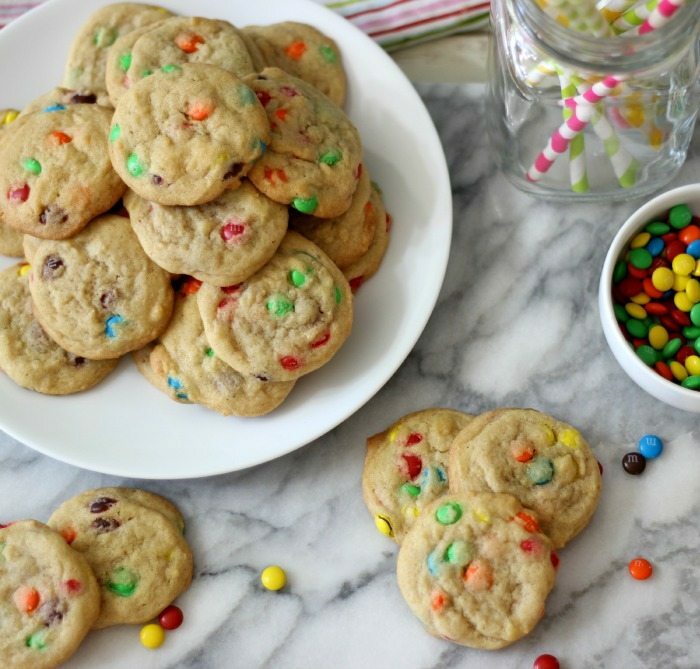 Anyway, I saw on the rack Mini M&M’s and I knew I had to buy them to make cookies. I have to admit to you these cookies are good! They are light, buttery, sweet but not overly too sweet and so cute! I am in love with my new cookie. 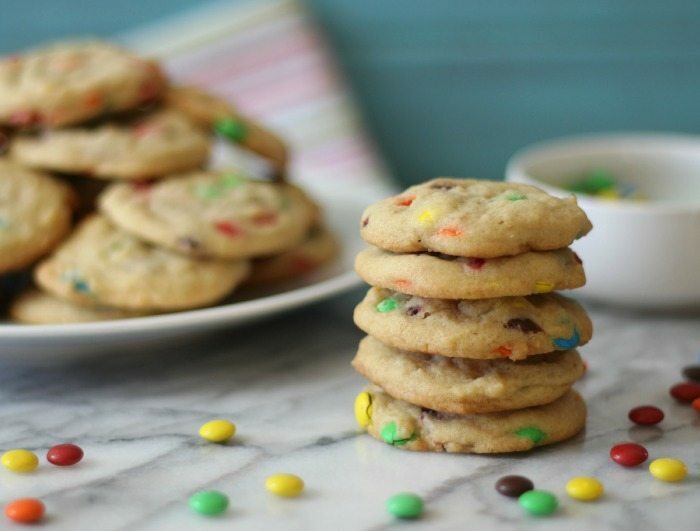 The cookie part is a combination of a sugar cookie and a chocolate chip cookie. They are soft centered and crispy around the edges. I under-baked them by about a minute to keep them soft in the middle. The little M&M’s are great too. 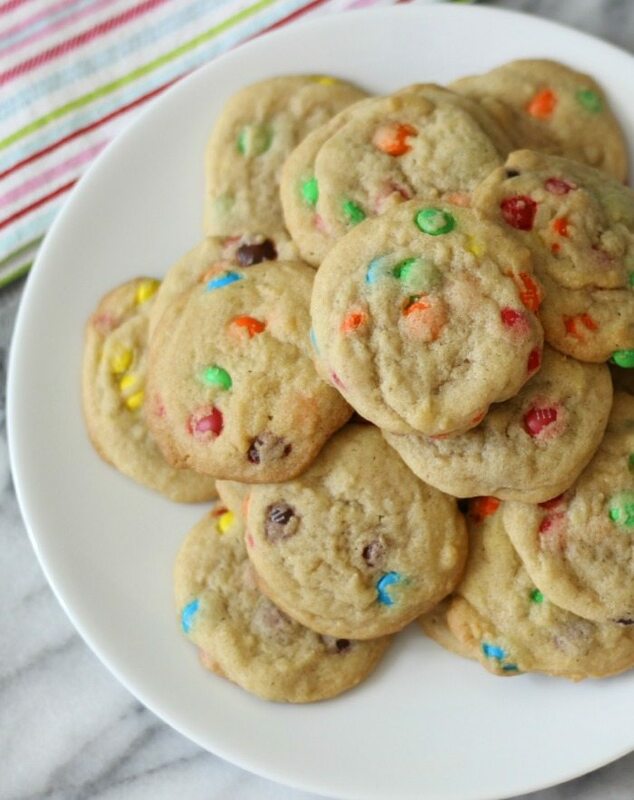 They barely cracked like regular M&M’s do in cookies when baking. The recipe is a breeze to make too! 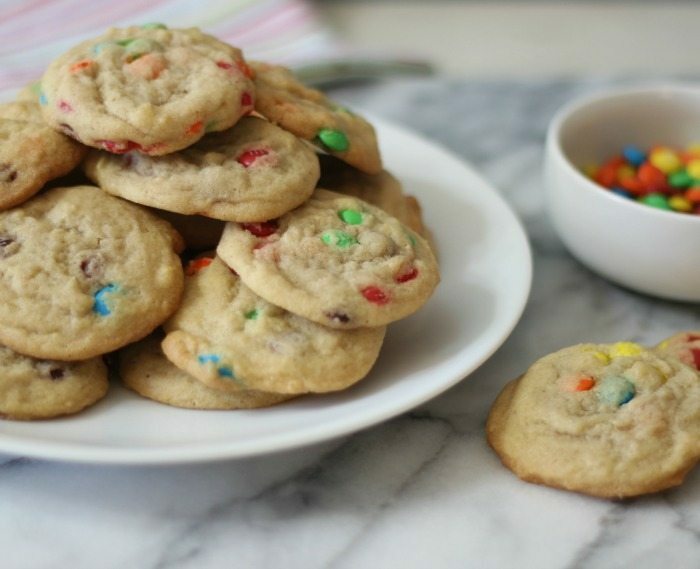 The ingredients are the basics; flour, sugar, butter and Mini M&M’s. The recipe makes 54 cookies, well maybe a little more, but I did eat the batter. Speaking of batter, did you know that cookie dough batter has more calories than a cookie? I don’t understand how that all works, but it’s true. So if you can resist, don’t eat the batter. I was weak and took a few little scoops. These cookies would be great for a kids party. They are so colorful and get this only 77 calories and 6 grams of sugar. I don’t think that is too bad for cookies. Mmmm, cookies…. The cookies will last about 7 days in a sealed container or you can freeze them for up to 3 months. I froze half the batch. You know what else? Frozen cookies taste good to eat too! 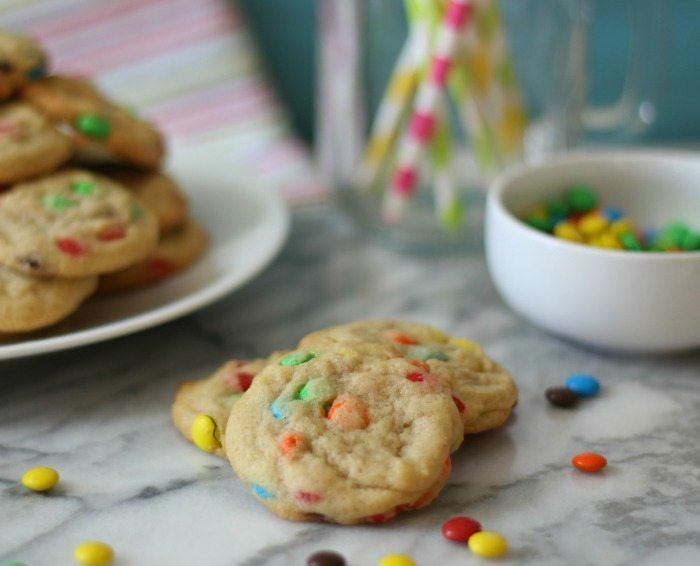 A light, buttery cookie chock full of Mini M&M's. Perfect for making with your kids. In a bowl, add flour, salt and baking soda; mix together; set aside. In a large bowl, Cream butter with both sugars until mixture is light and fluffy. Add egg and vanilla and beat to combine. Mix in dry ingredients. Stir in candy. Using a teaspoon and drop a heaping spoon of dough two inches apart on an prepared cookie sheet. Bake for 8 to 10 minutes or, until edges are just starting to burn. Cool for 2 minutes, than place onto a cooling rack. Store in an airtight container for up to 1 week or freeze for up to 3 months. I just love making cookies so much. I think it is one of my favorite things to make. Cookies bring so much joy to friends and family and that my friends is the real reason why I love to make cookies. Have a wonderful weekend! Check out my blog on Sunday for a great pasta recipe. These sound great Jennifer. And 77 calories? That’s awesome!